I had decided we were done with subscription boxes for a while, but then I heard about the Loot Pets box by Loot Crate and lost my mind. I mean look how cool this is! 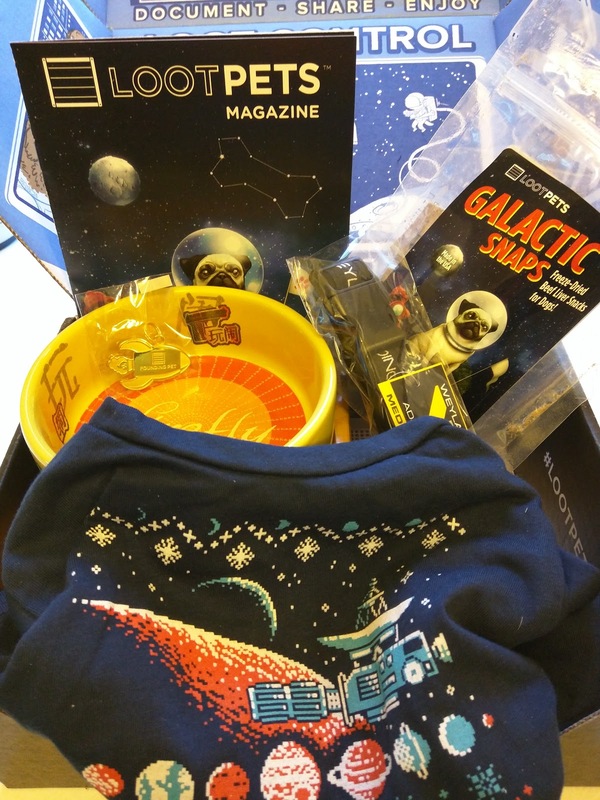 Loot Crate does subscription boxes for geeks and gamers, with fandom-related goodies. For those unaware, I am so geeky that I've read the complete works of H.P. Lovecraft, seen every episode of every iteration of Star Trek, and own the original three Star Wars films on laserdisc. That's right, laserdisc. Clearly the Loot Pets box was made just for us. A Hypergalactic T-shirt by Loot Crate Labs, with planets and satellites and snowflakes and a lovely blending of space and winter. I had some trouble picking out the shirt size because Ru is so long and slinky. I love the length of this shirt on him, but it is very wide. I may dust off my sewing machine and sew a dart down the belly to improve the fit. We also got a Founding Member Collar Charm, for subscribing to the first-ever Loot Crate for pets. It's a gold rocket ship, so much more awesome than the usual bones and hearts. There's a collar branded Weyland-Yutani, the scary corporation from the Alien films. Instead of the company logo, "Building Better Worlds", the collar says "Building Better Dogs". It's by Quantum Mechanix. This collar will fit both Sisci and Brisbane. This is definitely one of the coolest things in this box, it's so awesome I can't even stand it. I adore subtle fandom fun, this is why I have a Miskatonic University parking pass sticker on my car. The Firefly Troublemaker Dog Dish is the other super awesome item in our box. It has a non-skid ring on the bottom and is dishwasher, microwave, and oven-safe. It's a nice size, small enough for a big Ru bowl but big enough for Brisbane's dinner most nights. This one's also by Quantum Mechanix, makers of accurate, awesome, and sometimes delightfully subtle film and tv series goodies. The last thing in here is a bag of Galactic Snaps Dog Treats by Loot Crate Labs. They are made from freeze-dried beef liver and nothing else, so Brisbane gets to have some! Overall this is basically the best subscription box ever. I guess it's more for me than for them this time, given that there was only one bag of treats and no toys in there, but I'm sure they'll be something squeakable or throwable or chewable in there next month. What's your favorite geek fandom? I know, right? I thought the world needed to know about this one.